This story has nothing to do with blackwood, but in the tonewood business this recent research regarding Sitka spruce (Picea sitchensis) should be causing considerable discussion. Sitka spruce is the mostly widely used timber in soundboards in acoustic guitars. Sitka spruce grows in the NW USA, western Canada and into Alaska. It has been heavily logged over the last 100 years to meet many market demands and end uses. Consequently sources of big old trees suitable for the tonewood market are becoming scarce. Tradition has it that slow, even-grown sitka spruce makes the best soundboards. This tradition of slow even growth for soundboard timber goes back centuries to the violin makers of Italy, and possibly before that time. But with the supply of this kind of timber in peril, a bit of research can go a long way. 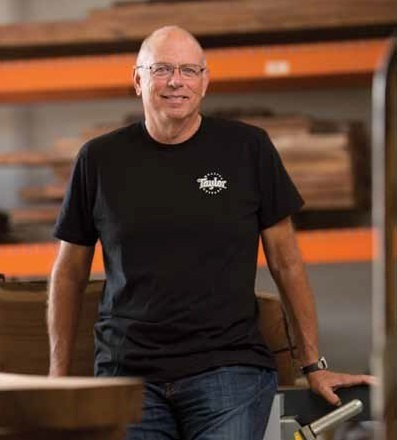 One of the major suppliers of Sitka soundboard timber is Pacific Rim Tonewoods, based in Washington State. They recently sponsored some research to compare the wood properties of Sitka spruce of different growth rates. It’s not the best written report, and there is no presentation of statistical analysis. But despite this the results should be turning the musical instrument world on it’s head. Guess what? After hundreds of years of tradition the research clearly showed that faster grown Sitka spruce had better sound qualities than slow grown Sitka! 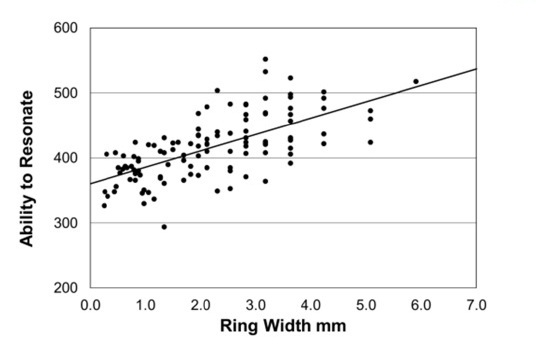 Fast grown Sitka in this case was defined as having an average annual growth ring width of 4.5mm, compared to slow grown Sitka at 1.1mm ring width. This is great news as it means that much more timber is now potentially available for the soundboard market. I say “potentially” because in the music instrument market traditions can be hard to break. You and I as consumers need to understand the consequences of our choices. But in this case changing our spending preferences is a win for us and a win for the forests. So next time you go shopping for a new acoustic guitar, look out for those guitars with the nice even, wide growth rings. They will give you a better sound, and help save the forests. I noticed one in my local music store just the other day. Thanks to Pacific Rim Tonewoods for helping us all make better choices for ourselves and the planet. It was great seeing someone from the special timbers industry, who understands that peace is fundamental to the future of the forest industry getting some good media coverage. 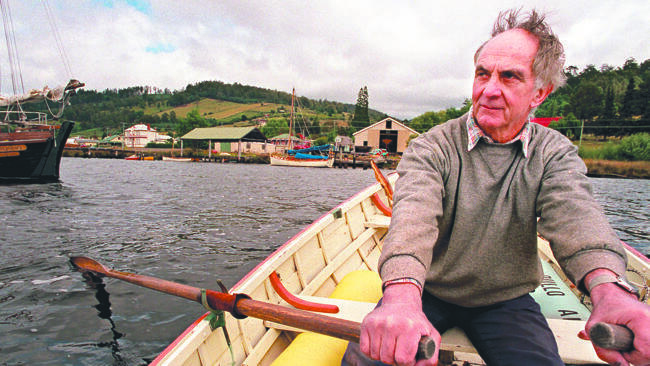 John Young, wooden boat builder and founder of the Shipwrights Point School of Wooden Boatbuilding in Franklin, had many interesting comments and suggestions to make about the past and current state of the Tasmanian forest industry, and forest management. And while I totally agree that peace in the forests is the first priority and absolutely fundamental to the future of the industry, Mr Young’s comments and ideas raised more questions than provided answers. As a special timbers commercial competitor on private land, Mr. Young’s comments left me with the impression he does not regard special timbers as a commercial resource requiring fully dedicated profit-driven commercial management. Such a position clearly undermines the ability of Tasmanian farmers to grow commercial blackwood. It also shows a great disregard for Tasmanian taxpayers who are currently subsidising the special timbers industry, while our State health and education systems are in financial crisis. If Tasmania cannot maximise the sustainable commercial return from it’s public special timbers resource then it should not be logged. Special timbers should not continue to be managed as a taxpayer-funded community service. My other concern regarding Mr Young’s comments is that I’ve been reading and hearing “alternative” forest management strategies like this for the past 30+ years. All of the dreams of “if only they” and “why don’t they” of a better forestry world. I think what the past 30 years have clearly demonstrated is that these dreams have never amounted to anything. The politicians, Forestry Tasmania and the forest industry “heavy weights” have never expressed any interest in changing the pro-industrial mass-harvest forestry model. Not in any comprehensive meaningful way. Certainly the Tasmanian Forestry Agreement (TFA) showed no change at all to the status quo and neither has the new Liberal State government. And now the sector of the forest industry most clearly disadvantaged by this pro-industrial model, the special timbers industry, is being used by the politicians and sectors of the community as the pretext for returning Tasmania to the forestry wars. Tearing up the TFA is all about the special timbers industry. Blatant naked hypocrisy! There is not bright new happy future. There is no special timbers business plan or management plan. I think after 30 years of failed “alternative” forestry dreams it should be obvious to just about everyone that the dreamers are now part of the problem. They are now being shamelessly manipulated for political ends. Keep dreaming and you help to feed the cycle of forestry conflict and failure. The Tasmanian community has paid a huge price for the forestry wars and it is time to stop. It is blatantly obvious after 30+ years that Tasmania does not have the skills required to commercially manage its public native forest in a manner that is sustainable, maximises commercial returns, whilst minimising social and political conflict. It is time for the forest industry, including the special timbers industry, to move 100% onto private land. To me that seems the only way we will ever put the forestry wars behind us. For Mr Young and the wooden boat builders that will be a difficult transition. Mr Young wants peace and a happy ending. But the past 30 years have shown the reality regarding boat building timbers on public land, and that reality shows no sign of changing. On the contrary the situation is getting worse. The only happy ending that is now apparent will be when we end public native forest logging. The last State election demonstrated that beyond any doubt whatsoever.